Anglican, artefact, George Frederick Bodley, Cloisters, Dublin, England, Gothic, Gothic Revival, Hobart, Ireland, pillar, Salisbury Cathedral, St David’s Cathedral, St Patrick’s Cathedral, spire, Tas, Tasmania, Tudor Rose, Wales, Westminster Hall. St David’s Cathedral, Hobart, was designed by English architect George Frederick Bodley (1827-1907) in 1865 in the Gothic Revival style, with further revisions in 1891. As the foundation stone for the Cloisters and Tower were not laid until 1892 they are likely to have been part of those revisions. 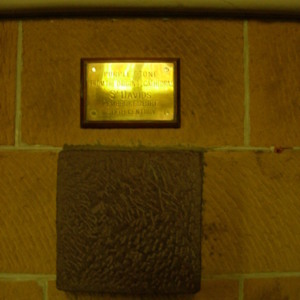 They were completed and consecrated in 1936. 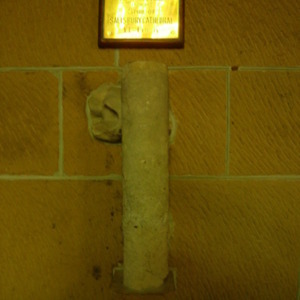 The Cloisters building acts as a museum and features a number of original medieval artefacts on its walls. 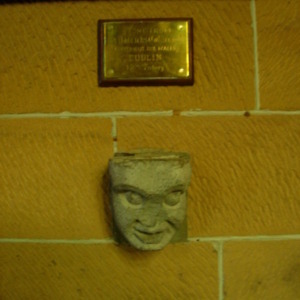 The photographs below are of four of the items: a sculpture of a head from the wall of the twelfth-century St Patrick’s Cathedral in Dublin, a pillar from a spire on the fourteenth-century Salisbury Cathedral in England, a fifteenth-century Tudor Rose stone from the eleventh-century Westminster Hall in London, and a stone from the sixth-century St David’s Cathedral in Wales. The artefacts in the Cloisters provide a good opportunity for the public to interact with medieval material culture. Anglican, artefact, Cloisters, Dublin, England, George Frederick Bodley, Gothic, Gothic Revival, Hobart, Ireland, pillar, Salisbury Cathedral, spire, St David’s Cathedral, St Patrick’s Cathedral, Tas, Tasmania, Tudor Rose, Wales, Westminster Hall. 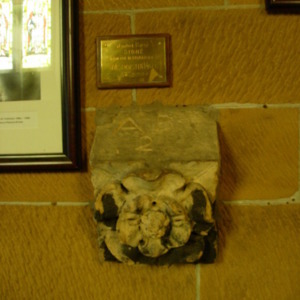 “Medieval artefacts, St David’s Cathedral, Hobart, Tasmania,” Medievalism in Australian Cultural Memory, accessed April 23, 2019, http://ausmed.arts.uwa.edu.au/items/show/1160.